Cobblers striker Leon Lobjoit has joined Vanarama National League North side Nuneaton Town in a month-long loan deal. The 22-year-old has spent the past month at Corby Town, and after being recalled from the Rockingham Triangle on Friday, he is quickly on the move again. Lobjoit’s spell at Corby was deemed a big success, as he became a key player as the Evo-Stik First Division South outfit pieced together a string of wins to pull away from the bottom of the table and into the promotion play-off places. In all, Lobjoit scored three goals for the Steelmen as they won six games in a row. 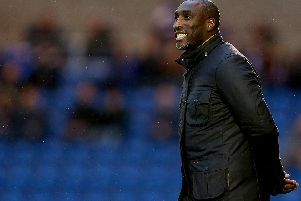 Nuneaton play two steps above the Steelmen in the football pyramid, in the same division as Brackley Town, and Cobblers boss Jimmy Floyd Hasselbaink is keen to see how the player copes with the step up in quality. “Leon did really well at Corby and his month there was a big success,” said the Town manager. “He played some games and scored some goals and helped Corby out in the process. “The next step for him is to move up a level with Nuneaton. Nuneaton are currently managerless, with Tommy Wright quitting the club last week to take over at Darlington, and are battling to avoid relegation after a slow start to the season. They have won two of their past four fixtures to move out of the drop zone, but were beaten 3-1 at home by Stockport County last weekend. Lobjoit is set to feature in Nuneaton’s trip to FC United of Manchester on Saturday, which is an early season relegation scrap, with United 22nd and Nuneaton 19th, one place above the drop zone. Nuneaton’s club captain is former Cobblers skipper Kelvin Langmead, but he has yet to play this seasaon after suffering an Achilles injury in pre-season. He is due to return to action at the turn of the year. As well as Lobjoit going out on loan to Nuneaton, the club have announced that teenage striker Joe Iaciofano is to spend a second month with Chesham United. Iaciofano has been a big hit while on loan at the Vanarama National League South side, scoring four times in seven appearances, and he will spend another month-long spell at The Meadow. But the Cobblers have confirmed there is a clause in the deal that means Iaciofano can be recalled to Sixfields at 24 hours’ notice.